Ceramic pigments open up a world of colorful possibilities! The raw colors of the assorted stains above are close to the actual fired color. Ceramic pigments, often referred to as ceramic stains, have vastly opened up the color possibilities for potters. And as we all know, adding color to your ceramic art can be a tricky proposition. Unlike working with paints, the raw glaze you put on your prize pot or sculpture often looks completely different from the fired result. So it helps to have a good understanding of all of the options out there for ceramic artists. In this post, we provide the lowdown on ceramic pigments. – Jennifer Poellot Harnetty, editor. Prepared ceramic pigments, commonly referred to as ceramic stains, expand the potter’s palette with infinite possibilities. Pigments provide a wide range of color possibilities in clay bodies, inglazes, underglazes, and onglazes. In order to get a full range of consistent ceramic colors, pigments are used with metallic oxides and salts, many of which are soluble or toxic, to make them stable. By combining these elements, along with clays, silica, and alumina, the industry has come up with 44 different calcined pigment systems covering the entire color spectrum. Ceramic pigments solve some of the problems found in using just plain oxides. For example, when pure chrome oxide is used as a colorant to obtain green, it may fume or volatilize in the kiln leading to absorption into the kiln bricks and shelves. The oxide may also effect the color of the glaze. If tin is present in a white or pastel glaze, the chrome reacts with the tin to create a pink coloration. In addition, if any zinc oxide is present in the glaze, you’ll get a dirty-brown color. The solution is to use a green ceramic pigment, of which there are several. One such system is the cobalt-zinc-alumina-chromite blue-green pigment system, where varying the amounts of cobalt and chrome oxides produces a range of colors from green to blue-green to blue. Mason 6244 is an example of this pigment. Depending on the use, pigments may be used straight and just mixed with water, but they are more commonly added as colorants in clay bodies and glazes. Some pigments are specifically formulated for clay bodies while some are not suitable at all. When used in clay, pigments are usually used in engobes and slips as a coating for clay rather than pigmenting the entire body. The exception to this would be using stains to tint porcelain for neriage work. Use in concentrations of 10–15% in clay, using more or less depending on the intensity needed. Add the pigment to the slip and sieve through a 120x mesh screen to ensure adequate dispersion. 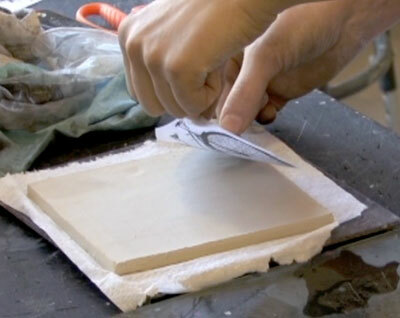 Pigments can be used in underglazes for brushing onto greenware or bisque. If used only with water as a medium, some glazes may crawl, so for best results, mix the stains with a frit (for example, Ferro frit 3124). Begin with a mix of 85 frit/15 pigment and test. Transparent gloss glazes applied over the top will heighten the intensity of the colors. When using pigments in glazes, usually in concentrations of 1–10%, a little more care must be taken because some pigment systems react with materials in a glaze. Some pigments are affected by the presence, or lack of, boron, zinc, calcium, and magnesia. Manufacturers provide information on specific reactions. While most pigments can be used in both oxidation and reduction atmospheres, some are limited to certain maximum temperatures. Again, this information is available from manufacturer websites. To achieve a wider palette, most pigments can be mixed to achieve even more colors. The exception is that black pigments cannot be used to obtain shades of gray because blacks are made from a combination of several metallic oxides. If low percentages are used, the final color is affected by the predominant oxide in the black pigment. When using ceramic pigments alone or in combination with other pigments and/or oxides, you’ll need to test them with the frit, glaze, and slip bases you intend to use. A good starting point is either using some of the published recipes or using frits. Because pigments are expensive to manufacture, their cost is higher than that of ceramic oxides, but you’ll find most suppliers will sell ceramic pigments in quantities as small as ¼ pound. Finally, safety is always an issue. Suppliers are required by law to provide a Material Data Safety Sheet (MSDS), and there are different precautions listed with each pigment or family of pigments. Make sure you read and follow the instructions listed in the MSDS for safe handling. When used as underglazes, surfaces coming into contact with food must be covered by a food-safe transparent glaze, and glazes containing pigments should be tested for food use. Sources: Understanding Glazes, by Richard Eppler and Mimi Obstler, The American Ceramic Society, 2005, and Mason Color Works, www.masoncolor.com. Add:, alumina, american ceramic society, art, artists, bases, bisque, body, ceramic, ceramic art, ceramic artists, ceramic oxides, ceramic pigment, ceramic pigments, ceramic stains, chrome, chrome oxide, clay, color, colorant, colorants, colors, combining, dispersion, ferro frit 3124, frit 3124, glaze, glazes, greenware, kiln, kiln bricks, materials, neriage, oxidation, palette, porcelain, possibilities, pot, potter, potters, recipes, reduction, safe, safety, sculpture, shelves, sieve, silica, slip, solution, stains, surfaces, transparent glaze, understanding glazes, water, wide range, zinc, zinc oxide. How can a glaze be tested for safety in pottery intended for food use? relay thanks , there are very interesting possibilities about achieving colors to ceramics. Hi, I have a small studio in London and am looking for a supplier for stains I can mix into my clay (porcelain) but am having trouble finding a supplier. Can anyone recommend one? No problem if it’s non EU. Someone suggested that I add some frit to my colored slips if I want to use them on bone-dry ware. Frit 3134 was suggested. Does anyone know what percentage would be a good place to start? Calling from Denmark! For Raku glazing – I am interessed in using the metallic – silver nitrat – oxide, to make a golden shine. Have you got a formular for a good and secure glaze? I am aware of the danger of this oxide. thanks a lot Bill! I realy enjoyed your post. I think it can be useful for every potter to be familiar with colors.